In ancient Mesopotamia, doves were prominent animal symbols of Inanna-Ishtar, the goddess of love, sexuality, and war. Doves are shown on cultic objects associated with Inanna as early as the beginning of the third millennium BC. Lead dove figurines were discovered in the temple of Ishtar at Aššur, dating to the thirteenth century BC, and a painted fresco from Mari, Syria shows a giant dove emerging from a palm tree in the temple of Ishtar, indicating that the goddess herself was sometimes believed to take the form of a dove. In the Epic of Gilgamesh, Utnapishtim releases a dove and a raven to find land; the dove merely circles and returns. Only then does Utnapishtim send forth the raven, which does not return, and Utnapishtim concludes the raven has found land. In the Japanese mythology, doves is Hachiman's familiar spirit. Hachiman is the syncretic divinity of archery and war incorporating elements from both Shinto and Buddhism. According to the biblical story (Genesis 8:11), a dove was released by Noah after the flood in order to find land; it came back carrying a freshly plucked olive leaf (Hebrew: עלה זית alay zayit),[Gen 8:11] a sign of life after the Flood and of God's bringing Noah, his family and the animals to land. Rabbinic literature interpreted the olive leaf as "the young shoots of the Land of Israel" or the dove's preference for bitter food in God's service, rather than sweet food in the service of men. The Talmud compares the spirit of God to a dove that hovers over the face of the waters. In post-biblical Judaism, souls are envisioned as bird-like (Bahir 119), a concept that may be derived from the Biblical notion that dead spirits "chirp" (Isa. 29:4). The Guf, or Treasury of Souls, is sometimes described as a columbarium, a dove cote. This connects it to a related legend: the "Palace of the Bird's Nest", the dwelling place of the Messiah's soul until his advent (Zohar II: 8a–9a). The Vilna Gaon explicitly declares that a dove is a symbol of the human soul (Commentary to Jonah, 1). 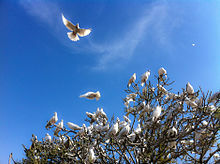 The dove is also a symbol of the people Israel (Song of Songs Rabbah 2:14), an image frequently repeated in Midrash. The symbolism of the dove in Christianity is first found in the Old Testament Book of Genesis in the story of Noah’s Ark, “And the dove came in to him at eventide; and, lo, in her mouth an olive-leaf plucked off: so Noah knew that the waters were abated from off the earth.” Genesis 8:11 And, also, in the New Testament Gospels of Matthew and Luke, both passages describe after the baptism of Jesus, respectively, as follows, “And Jesus when he was baptized, went up straightway from the water: and lo, the heavens were opened unto him, and he saw the Spirit of God descending as a dove, and coming upon him.” Matthew 3:16 and, “And the Holy Spirit descended on him in bodily form like a dove. And a voice came from heaven: “You are my Son, whom I love; with you I am well pleased.” Luke 3:22 The Holy Spirit descending on Jesus and appearing in the bodily form of a dove is mentioned in the other two Gospels as well (see Mark 1:10 and John 1:32). Christians derived the symbol of the dove and olive branch from Greek thought, including its use of the symbol of the olive branch, and the story of Noah and the Flood. Although Jews never used the dove as a symbol of peace, it acquired that meaning among early Christians, confirmed by St Augustine of Hippo in his book On Christian Doctrine and became well established. The early Christians in Rome incorporated into their funerary art the image of a dove carrying an olive branch, often accompanied by the word "Peace". It seems that they derived this image from the simile in the Gospels, combining it with the symbol of the olive branch, which had been used to represent peace by the Greeks and Romans. The dove and olive branch also appeared in Christian images of Noah's ark. The fourth century Vulgate translated the Hebrew alay zayit (leaf of olive) in Genesis 8:11 as Latin ramum olivae (branch of olive). By the fifth century, Augustine of Hippo wrote in On Christian Doctrine that "perpetual peace is indicated by the olive branch (oleae ramusculo) which the dove brought with it when it returned to the ark". In the earliest Christian art, the dove represented the peace of the soul rather than civil peace, but from the third century it began to appear in depictions of conflict in the Old Testament, such as Noah and the Ark, and in the Apocrypha, such as Daniel and the lions, the three young men in the furnace, and Susannah and the Elders. Before the Peace of Constantine (313 AD), in which Rome ceased its persecution of Christians following Constantine's conversion, Noah was normally shown in an attitude of prayer, a dove with an olive branch flying toward him or alighting on his outstretched hand. According to Graydon Snyder, "The Noah story afforded the early Christian community an opportunity to express piety and peace in a vessel that withstood the threatening environment" of Roman persecution. According to Ludwig Budde and Pierre Prigent, the dove referred to the descending of the Holy Spirit rather than the peace associated with Noah. After the Peace of Constantine, when persecution ceased, Noah appeared less frequently in Christian art. Medieval illuminated manuscripts, such as the Holkham Bible, showed the dove returning to Noah with a branch. Wycliffe's Bible, which translated the Vulgate into English in the 14th century, uses "a braunche of olyue tre with greene leeuys" ("a branch of olive tree with green leaves") in Gen. 8:11. In the Middle Ages, some Jewish illuminated manuscripts also showed Noah's dove with an olive branch, for example, the Golden Haggadah (about 1420). Doves are often associated with the concept of peace and pacifism. They often appear in political cartoons, on banners and signs at events promoting peace (such as the Olympic Games, at various anti-war/anti-violence protests, etc. ), and in pacifist literature. A person who is a pacifist is sometimes referred to as a dove (similarly, in American politics, a person who advocates the use of military resources as opposed to diplomacy can be referred to as a hawk). Picasso's lithograph, La Colombe (The Dove), a traditional, realistic picture of a pigeon, without an olive branch, was chosen as the emblem for the World Peace Council in Paris in April 1949. The dove became a symbol for the peace movement and the ideals of the Communist Party and was used in Communist demonstrations of the period. At the 1950 World Peace Congress in Sheffield, Picasso said that his father had taught him to paint doves, concluding, "I stand for life against death; I stand for peace against war." At the 1952 World Peace Congress in Berlin, Picasso's Dove was depicted in a banner above the stage. Anti-communists had their own take on the peace dove: the group Paix et Liberté distributed posters titled La colombe qui fait BOUM (the dove that goes BOOM), showing the peace dove metamorphosing into a Soviet tank. The rock dove is, due to its relation to the homing pigeon and thus communications, the main image in the crest of the Tactical Communications Wing, a body within the Royal Air Force. Below the crest is the wing's motto, "Ubique Loquimur", meaning "we speak everywhere". ^ a b c d e f g Botterweck, G. Johannes; Ringgren, Helmer (1990). Theological Dictionary of the Old Testament. VI. Grand Rapids, Michigan: Wm. B. Eerdmans Publishing Co. pp. 35–36. ISBN 0-8028-2330-0. ^ a b The Enduring Symbolism of Doves, From Ancient Icon to Biblical Mainstay by Dorothy D. Resig BAR Magazine Archived 31 January 2013 at the Wayback Machine. Bib-arch.org (9 February 2013). Retrieved on 5 March 2013. ^ Simon, Erika (1983). Festivals of Attica: An Archaeological Companion. Madison, Wisconsin: University of Wisconsin Press. ISBN 0-299-09184-8. ^ "Babylonian Talmud Sanhedrin 108b". Halakhah.com. Retrieved 21 February 2012. ^ "Eruvin 18b" (PDF). Retrieved 21 February 2012. ^ "Talmud, Tractate Moed, Hagiga 15a" (PDF). Retrieved 21 February 2012. ^ "Jewish Encyclopedia". Jewish Encyclopedia. Retrieved 21 February 2012. ^ "''Catholic Encyclopedia'', Roman Catacombs: Paintings". Newadvent.org. 1 November 1908. Retrieved 21 February 2012. ^ Augustine of Hippo, ''On Christian Doctrine''. Google Books. ISBN 9781593774943. Retrieved 21 February 2012. ^ "''Catholic Encyclopedia'', Dove: As an artistic symbol". Newadvent.org. 1 May 1909. Retrieved 21 February 2012. ^ "British Library, ''The Holkham Bible''". Bl.uk. 30 November 2003. Retrieved 21 February 2012. ^ "Wycliffe Bible, Gen 8:11". Studylight.org. Retrieved 21 February 2012. ^ British Library, Online Gallery, Sacred Texts. The Golden Haggadah, p.3, lower left hand panel. ^ "Museum of Modern Art". Moma.org. 9 January 1949. Retrieved 13 March 2014. ^ "Tate Gallery". Tate.org.uk. Retrieved 13 March 2014. ^ "BBC Modern Masters". Bbc.co.uk. 1 January 1970. Retrieved 13 March 2014. ^ "Princeton University Library". Infoshare1.princeton.edu. Retrieved 13 March 2014.